Outdoor Retailer is the single largest event that brings outdoor manufacturers together to show off, hoping to get their newest wares onto the shelves enticing local climbers. Another benefit for the manufacturers is the chance to get a little media attention: We spent more than 6 hours a day for 4 days filming gear, and we captured a ridiculous number of new products. Below, you’ll find the most comprehensive listing of the freshest rock gear available: the new, the notable, the weird, and the utterly fabulous. Most rock climbing companies are expanding horizontally, getting into areas they’ve never been before (expect many new harnesses/childrens’ gear, and a ton of keylock solid-gate carabiners/draws). Most of these products aren’t revolutionary, but are instead the introduction of a new series, hopefully something that the brand will be able to build and improve upon in the future. That said, there still are some interesting new products, mostly in belay devices (see CAMP, DMM, and SMC), and definitely in ropes (see Edelrid, New England Ropes, and Tendon). I think we’re on the brink of some really exciting changes and new technologies coming to ropes. And for those of you looking to jug up those ropes, you’ll find a few excellent surprises (see Black Diamond and Petzl). AR-385a and AR-395a – The All-Around series has adjustable leg loops and even has 4 ice clipper slots allowing for you to take it just about anywhere (female version is a bit lighter than the male version). FL-355 and FL-365 – The Fast and Light version comes with with fixed leg loops, 4 gear loops, and is 355-365 grams (women’s and men’s respectively). It claims to have the ideal balance of lightweight and versatility, particularly for alpine climbs, but no slouch at the crag. SL-340 – The Superlight harness (340 grams), has just 2 gear loops and fixed leg loops making it Arc’teryx’s lightest and most compact climbing harness. PRism Pad Series – Design, particularly around color schemes is what Asana is focused on with this series. Paul Robinson (a V14 boulderer sponsored by Asana) and Jamey Sproull (the owner of Asana) worked together to make a series that aesthetically represents Paul’s 5 favorite places to climb through color, including Cape Town, Rocklands, Fontainebleau, Red Rocks, Ticino, and Rocky National Park. Interview coming soon. Fifty Fifty – A carabiner whose gate can open on either end. We didn’t actually get to check this guy out in person, so we definitely have a lot of questions and curiosities as to the problems it’s solving and it’s durability. But, we are supporters of new innovation so we still cheers AustriAlpin for going where nobody else has gone. Photo thanks to Malcom Daly. Watch a video on youtube to see the gate action. Opera – An 8.5mm certified single, half and twin, rope. The weight is record-breaking. The Opera is 48 g/m making it the first single-rope under 50 g/m. The impact force is also incredibly low, lower than any other single-rated ropes below 9mm. Watch a video to learn more. Mirage – This will be the first alpine/ski mountaineering harness to have a Recco reflector. This could assist in a dire situation when air and ground rescue teams come looking for you. What’s nice about Recco is that the performance does not degrade and will last far longer than the harness will (a lifetime). Index – An ascender whose catch can be used with your index finger instead of the only option being your thumb. This allows you to easily uncam the device to move up-rope, especially when the rope is unweighted. This is one of those perfect designs that you think “why didn’t anybody come up with this before? It’s so obvious!” Interview coming soon. Primrose and Momentum – These have traditionally been Black Diamond’s “intro” harnesses, priced to sell but packed with all the features you need to climb in most disciplines. They have a few updates to construction that allows them to keep costs low and also make this harness even more comfortable than in the past. Interview coming soon. Pipe Dream 45 and Creek 50 – BD also came out with some cragging packs, one geared towards sport climbing and one geared towards trad cragging.The Pipe Dream is geared towards those who go crazy on a project and need a good spot to re-energize–as it has a lot of padding that you can rest on before the next burn. The Creek is essentially a haulbag without the expensive materials used in normal haulbags. Normally we don’t focus on packs, but KP was so excited about these packs we had to include it in our roundup. 9.3mm Wave – This rope takes after the popular 9.1mm Icon. It’s super durable because it has a braided 40-carrier sheath construction (instead of the standard 48-carrier) that creates a tighter weave on the sheath that will assist with rope drag and its resistance to dirt and grime. 60-80m, dry options, and bi-color available. Watch a video to learn more. Nano 22 (updated) – The Nano got a pretty serious update. In addition to losing a gram, the shape has changed a bit – it now resembles a mini-Photon. But the biggest change comes in the gate action: it’s significantly smoother, consistent, and easier to use. Sold as a 6-pack or in 8 individual colors. Interview coming soon. Matic – The goal of this break-assisted device is to making climbing safer. Trad craggers/big wallers/aiders will enjoy the reduced impact on their protection (the camming action intentionally allows for rope slippage to lessen impact forces). There’s also the anti-panic system: When lowering, if you crank the handle in panic, the device will automatically lock. It’ll work with ropes 8.6-10.2mm. Interview coming soon. Energy – A lean, low-profile harness with a simple set-it-and-forget-it adjustment system for the leg loops. Available in sizes XS-XL. Normally I get bored when people talk about price point gear, but this harness is coming out at $50, making it the cheapest, good-looking, fully featured harnesses on the market, woah! Interview coming soon. Air CR (updated) – Redesigned for a bit more comfort and durability. Breathable padding for the win. Speed (updated) – The foam is now fully encased in a shell to prevent denting and degradation through travel in a pack and general use. It also got a $10 price cut and some updated colors. Interview coming soon. Codex – An aggressive slipper with a single velcro strap. It’s low profile and downturned, with VibramXS(R) rubber. Perfect for technical overhanging climbs and dime edges as they made the last more rigid (compared to the double velcro Zero). Interview coming later. Pivot – A 72 gram guide-mode belay device that can simply, and with minimal effort, release the load (your follower) in a smooth, controlled process (with no prussik backup), this is thanks to a pivoting motion of the hot-forged device. Interview coming soon. 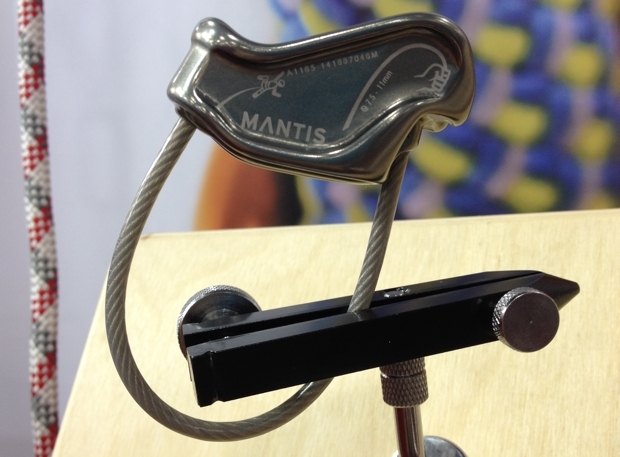 Mantis – Slimmed down version of the Pivot, it’s a more standard shaped tubular device. It accommodates ropes 7.5mm to 11mm. Cutting out guide-mode features allows it to be 45g. It would be great for gym climbing or cragging. Interview coming soon. Grip – In development for 5-6 years! A single rope tubular-style belay device. Under load, the device adds a break assist as splits in half. After you’re done breaking, the magnetic closure pulls it back together to continue normal belaying. Interview coming soon. Chimera – DMM took the Phantom wiregate and added a clean-nose, making it the lightest keylock wiregate, at 26 grams. Also as a quickdraw in 12, 18, 25cm on a skinny 8mm dogbone (the only 8mm sling in DMM’s line). Available summer 2014. Interview coming soon. Maverick 2 & Vertesse – Lightweight, stripped down, fixed leg loops, sport climbing harness in mens and womens versions. Mithril & Venture – Lightweight all-around harness, adjustable leg loops, in mens and womens versions. Rap Line II – A hybrid 6.5mm rope. Like a Screamer is to a quickdraw, the new Rap Line II is the same concept to a rope. With the static benefits for use as a rap/tag line, and the safety of a dynamic rope in an emergency situation, the rope turns dynamic with 3-4kN of force. Watch a video to learn more. Topaz 9.2mm – A triple-rated (single, half, twin) rope, where the color changes during the braiding process. Traditionally color changing was a 15 minute manual process, now it’s a fully-automated 2 min process. This time-savings will be passed to the customer with a reduced price. Watch a video to learn more. 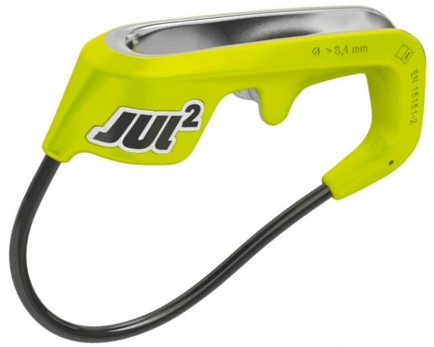 Jul II- A steel single rope tubular device with brake assist, it’s geared towards gym climbing and cragging when you don’t need to rappel. It’s designed for thicker / heavily used gym ropes. It has a lower impact force than the Mega/Micro Jul and it’s even a bit easier to micro-adjust while lowering the climber. Min diameter is 8.4mm (best results: 9.5+), and goes to 11mm. Interview coming soon. Fraggle & Finn (updated) – Fraggle is a full-body fully-padded harness with tangle-free arms/legs. It can also be used skiing or other places with the full-strength loop on the back of the harness. The Finn is a fully certified lead-certified climbing harness, it’s essentially an adult harness shrunk, with extra care for comfort and expanded sizing, so it’ll grow with your kid: Fraggle ->Finn ->Adult Small Jade. Interview coming soon. Wing – A laminated/padded hybrid harness for a positive weight/comfort ratio + packsize benefits. The foam will assist in comfort while walking and add breathability. Flexible gear loops in back will help with comfort with a pack on, and molded asymmetrical gear loops in the front for ideal racking. Tie-in point wear indicator, too. Interview coming soon. Slash – A quickdraw made in Europe; the carabiners are keylock solid gates with a straight top biner and a bent gate carabiner for the rope-side. It’s priced to sell, thanks to good ol’ cold-forging technologies. Updated Aliens shipping now. Alpine sling is on the way. In addition to the 6 sizes available now, 2 more larger sizes will be coming out. Updated offsets are set to arrive before 2015. Alien Evolution (updated Aliens) – These cams have 25% decreased weight and 20% narrower head profile. Achieved by reducing the amount of metal, manufacturing lighter slings in-house, and a new trigger made out of rubber. An alpine sling option is also on the way. All that and they’re coming out at a reduced price. Bam! Interview coming soon. 3 New Harnesses – With webcore technology (aka thin laser-cut shaped webbing). Interviews for the harness series coming soon. Apollo – All around rock harness with 2 waist buckles and fixed leg loops. Ares – With a “comfort box” waiting to receive your package. The harness connects to the leg loops differently to create more comfort in the crotch area, especially while walking (therefore women will find benefits too). Poseidon- Treated for water repellency. Designed for alpine/ice climbers and mountaineers. Master Mono – A single rope belay device that can also be used in guide mode, a first! Though, we’re not sure how often you’d want guide mode, without the ability to double rope rappel. Mega 6KG (twin gate locker) – When two opposing non-locking gates combine their forces, they create a locking gate! It’s stronger than a regular locker at 29kN closed gate strength. With a bit of practice, it should be safer and faster to use than a screwgate carabiner. Interview coming soon. Available now at GearCo-Op, after mid-September it’ll be available at other retailers. Right now you get a chalkbag and extras along with the shoe, this won’t be the case forever. Redline – Designed by Obe Carrion, the Redline is downturned in the toe-box (versus the entire foot), allowing the heel to fit more naturally. Archflex allows for a tighter, more comfortable fit. Driven and built for outdoor climbing, on overhangings, pockets, crimps, micro-edging. It works as a slipper, but lacing allows you to get micro-adjustmented. Lots of power in this shoe. Read more at the shoes own website. Interview coming soon. Lifeguard – There’s no official stats but what we can tell you is that Mad Rock is coming out with a brake-assist device that is going to be lighter than all the competitors and geared for ropes 8.9mm-11mm. Stay tuned. Zephir & Zephira (updated) – These harnesses (men’s and women’s models) have dyneema webbing that cuts down on weight. Mammut has also added a coating to create more stability to the belts. It’s also more breathable than the laminated harnesses on the market. Interview coming soon. Zephir Alpine (updated) – A pure athletes dream and is “probably not that commercial.” It was heavily influenced by athletes wanting to get the bare minimum of weight. Crag Slidelock – A sliding locking carabiner that opens when you press in on the gate button and slide down. Great locker for belaying or anchors. It has added safety over traditional screwlocks as it would be nearly impossible to open by accident. Interview coming soon. Re-organized Ropes – The big news in ropes this year is that the UIAA came out with a rigorous certification for ropes to be considered “dry.” Mammut’s top of the line “Dry” line of ropes passed this test (one of the few companies to do so), and they’ve now re-categorized their ropes as “Dry”, “Protect”, and “Classic.” Interview coming soon. Bravo Carabiner & Quickdraw – The Bravo carabiner is a straight gate keylock carabiner. The draw has a 1″ nylon webbing dogbone with the Bravo solid gate on top and wiregate on the bottom, preventing gate flutter. Interview coming soon. 10.2 Gym Rope – A rope option to start lead climbing in the gym (35m length), or an easy way to buy a big rope to cut into smaller sizes, perhaps sharing with friends (100m length). 35m is $135, 100m spool is $350. Cirque & Finesse (updated) – New outer material and a new inner material that is actually a puncture resistant snakebite fabric making the harness even more durable and supportive. Cirque=men, Finesse=women. Interview coming soon. Turbo (updated) – Features a larger belay loop that creates a little more room for men’s and women’s comfort. It also has an updated waist-belt design (increasing the comfort on an already comfortable harness) and has fixed leg loops. Interview coming soon. Note: New England Ropes has changed their name to Teufelberger. Though their dynamic climbing ropes are still under the Maxim brand name. Protect PA – A static Platinum(R) rope that means the core is weaved through the sheath every 60cm on the rope, completely eliminating sheath slippage by creating a permanent connection from the sheath to the core. Great for high abrasion and wet areas, when used as a tag/rap line, bolting, or route setting when you need a static rope. Available: 9mm, 10.5mm, 11.5mm, 12.5mm, about a dollar a foot. Watch a video to learn more. I took some liberties with the rope product catalog photos to give a better idea of what’s going on. See the catalog of the benefits here. Tephra – Hot forged carabiner that has a trapwire to prevent cross-loading and keeps the carabiner in-line with the belay device. The cool part is that the spring is the same for the gate and the hinge. Comes in screw and auto-locking versions. Interview coming soon. Vulcan – A wiregate carabiner whose silhouette is a lot like the Omega Pacific JC carabiner. It has an infinity wiregate that reduces the profile. It comes with a 26kN strength rating which is impressive for a lightweight carabiner. Interview coming soon. Load Flap – Easily carry 4 pads together, when you’re really pushing the limits. $25 with a surprising amount of design considerations for such a “simple” product: from the pocket to the straps, and even the direction of the weave of the fabric. Interview coming soon. Hirundos (updated) – Designed as a high-end performance harness, it’s lightweight and minimalistic. The harness foam was thermo-molded to reduce weight without reducing comfort. Extra thought was put into the stitching to avoid it coming in contact with the body. 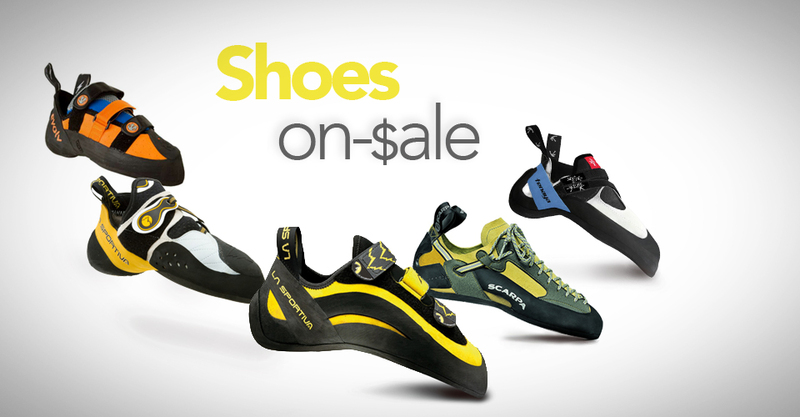 Ideal for sport climbing and cragging, especially if you’re climbing shirtless. Interview coming soon. Aquila – A sister harness to the Hirundos, it’s the adjustable leg loop version. It also has a wider waist belt and leg loops for more support and comfort, for sport climbing and alpine climbing. Interview coming soon. Kids Macchu and Body – Take an adult harness and shrink it. 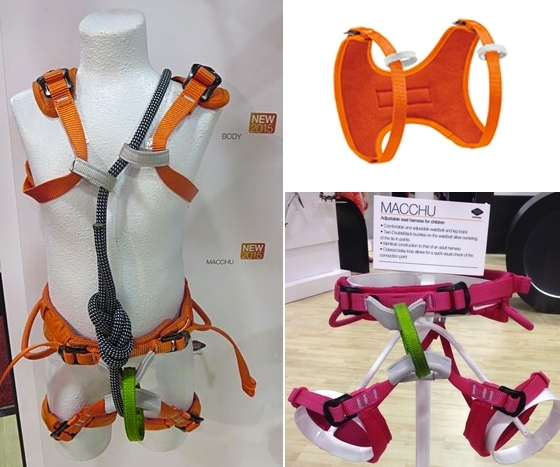 You now have a fully featured kids harness called the Macchu. The Body, is a chest harness that can accompany the Macchu when your fledgling climbing needs a bit more support. Available in orange and pink. Interview coming soon. Ascension (updated) – Petzl’s flagship ascender is now 20% lighter. It is also more ergonomic: the thumb catch is bigger for easier opening and closing, it has a more prominent pinky rest, and the top is rounder allowing easier grabbing with two hands. Interview coming soon. Penta – A hybrid helmet where the foam is encased in a protective covering, creating a good balance of strength/weight. The helmet has a nifty all-webbing harness system that makes it really easy to stash/pack. Perhaps slightly slower to adjust, that’s the exchange for lighter weight and increased packability. Interview coming soon. New Harness Line- More comfort, articulate gear loops, and wear indicators. The harnesses include a lightweight sport (single buckle, non-adjustable leg loops), an all around (male and female, single buckle, adjustable leg loops), an mountain-oriented harness (double buckle waistbelt and adjustable leg loops), and a big wall harness (a beast with fat leg loops and waistbelt and lots of gear loops). Interview coming soon. 9.7mm Test Tube, 9.9mm Spinal Cord, 10.2mm The Vein – It’s no surprise that a gym-based brand is coming out with ropes in 40m and 60m lengths. The shorter rope will be for indoor leading, while the longer rope can tackle your outdoor adventures as well. Both lengths available for each diameter. Spire – This belay device takes guide-mode to the next level. Not only is it lighter than the other guide-mode options but it allows you to perform a controlled lower of a second in guide-mode without needing a prussik backup. Currently it’s the only tubular device on the market to do so. Interview coming soon. Aero 9.2mm & Helix 9.5mm – Sterling took all the characteristics of the super-popular 9.8mm Velocity and popped them into some new sizes. The Aero has more elongation and a lower impact for than the Helix. Both the Aero and the Helix have a new core construction and a thicker sheath. The Helix has a thicker sheath than the 9.8 Velocity but softer handling. Nano 9.0mm (updated) – Sterling took their 9.2mm Nano characteristics and switched out the core, that resulted in a slightly stiffer, thinner and lighter rope. Ion R 9.4mm – Is a slightly stiffer version of the Ion 9.4mm. It has a tighter sheath so it’ll pay out slack easier and will benefit from increased durability. Watch a video featuring the Aero, Helix, Nano and Ion R.
Gym Phenom 10.3mm – A rope for gym climbing. Sterling claims to have solved any fuzzing issues with this rope as they’ve changed the sheath construction. It also has a lower elongation that will make any gym climber smile. Lowe 8.4mm – A twin/half rope that, at 41 g/m, weighs as in similar to significantly thinner ropes. Yet, it has the handling characteristics and fall ratings found on much larger diameter ropes. Interview coming soon. Hattrick 8.6mm – A twin/half rope that has very unique insides: The core has special yarns interwoven that reduce sheath slippage dramatically. Your rope will still work even with an exposed core–you even jumar up the rope. Crag Pack – 48 Liters with a tapered shape, large side-access zipper, and comfortable suspension system. It has a dedicated shoe pouch, an angled guide book pouch for easy withdrawal, and a side pocket that holds an included tarp for a clean place to set your gear. Green or Blue, for $99 (?!!). Interview coming soon. Tarifa – A climbing shoe from Teneya, it picks up where the Oasi (their best-selling shoe) left off, with a stiffer, narrower and lower volume form. It also has a speed lace system and stretchy neoprene tongue with Vibram(R) sole. It’s downturned with a slight camber in the toebox–great for small edging. Available Fall 2014. Interview coming later. Offset Rocks – Super. Light. The design started with Wild Country’s anodized rocks which they essentially cut the side off, creating the offset. It also decreased the weight of the set by 35% compared to the ol’ rocks. Offsets make a fantastic addition to your regular set of nuts. Interview coming soon. Wild Wire Carabiner and Quickdraw – “The Wild Wires have been in the range for a very long time now, but we wanted to make them more beautiful” says Wild Country. They’ve also made the ‘biner stronger; it now boasts 10kN gate open and a whopping 29kN gate closed, without changing the weight (38 grams). Interview coming soon. Electron – A sport climbing carabiner and quickdraw. A straight and bent solid gate keylock carabiner set with a slightly bent spine that makes the gate opening larger and is helpful for gripping. They also feature a wide dogbone. Interview coming soon. 3 Locking Carabiners – Eos (oversized D), Ascent Light (HMS), Ascent (HMS). Common features: All screwgates with an impressive barrel that has very pronounced ridges for easier handling. The HMS’s are 9kN open gate strength. The top of the biners are also round stock, so the rope will roll really nice. There’s also a flat lower basket allowing it to sit perfectly in your belay loop. Interview coming soon. Helium Cams (updated) – Added an extendable sling to the thumb loop. 12kN looped, 10kN extended. Interview coming soon. I found a growing appreciation for companies who were condensing their lines, making a very conscious effort to focus their talents on very specific products for specific types of climbers (even if that’s the “all-around” climber). It seems that a lot of companies expanded quickly into new areas without a strong understanding of where they were going, or why, other than “we need to be in this market.” It definitely makes it hard for a consumer to figure out what the “best gear” is when so many models are virtually identical copycats. There is also an increasing trend on safety. How can climbing be safer, especially when so many new people are entering the sport everyday? Answering this question seems to be the focus of many manufacturers. The trend is toward designing gear that is foolproof and ridiculously strong. And finally, if you are looking for more gear that’s not just climbing hardware, here’s some good options to check out: more rock shoes and a bit of apparel on Splitter Choss, a wider array of climbing gear (stoves, etc) on the Alpine Start, and a few packs on Mediocre Mountaineering. Dennis van Hoek also has a great blog post with climbing gear from the equivalent show in Germany. And Gear Coop also has large photos and helpful commentary of their gear observations from the show on Day 1, Day 2, and Day 3. If there’s any gear you’re super stoked for, let us know in the comments, and we’ll work to get those in-depth interviews up faster. Just wanted to let everyone know we’re working hard to get the videos out as quickly as possible. As you can see there is a TON of footage to go through and I’m sure you’re going to like what you see, but we need to chop out all of the unnecessary banter first! Cheers and happy climbing! What’s the deal with the friends sling? You think they can switch with the current line? Great question. If you have the current version of the Heliums, it’s doubtful that Wild Country will be able to re-sling them with extendable slings. Wild Country is still looking into the possibilities, but right now they’re leaning towards not possible. This is because they modified the materials in the thumb loop to attain 10kN strength when the sling is extended (12kN non-extended). If you buy the newest Heliums that come with extendable slings and the slings wear out, Wild Country offers a re-slinging service in the UK (none planned in the US yet, though in theory you could send them to the UK and they’d send ’em back re-slung). If you want to geek out further on slings, I’d point you to Black Diamond’s QC Lab post about re-slinging camalots. Towards the bottom of the post they show some testing they did with extendable slings damaging the thumb loop with just a 3-4kN fall. So, unfortunately, it’s not as easy as just adding a sweet extendable sling to the thumb loop and calling it good. Let me know if that covers it or if you have any more questions! hey there allison, I was wondering if you got a chance to oggle that Dead bird stuff closely. I would love to know if the FL365 has a 5th gear loop in back. Now that the power is back on, I can reply! If memory serves correctly, there’s 4 (official) gear loops in all the normal spots, and then a haul loop in back. There’s also 4 ice clipper slots. I’ll check into this a bit more officially, and see if I can track down a photo of the backside. Thanks for writing in!